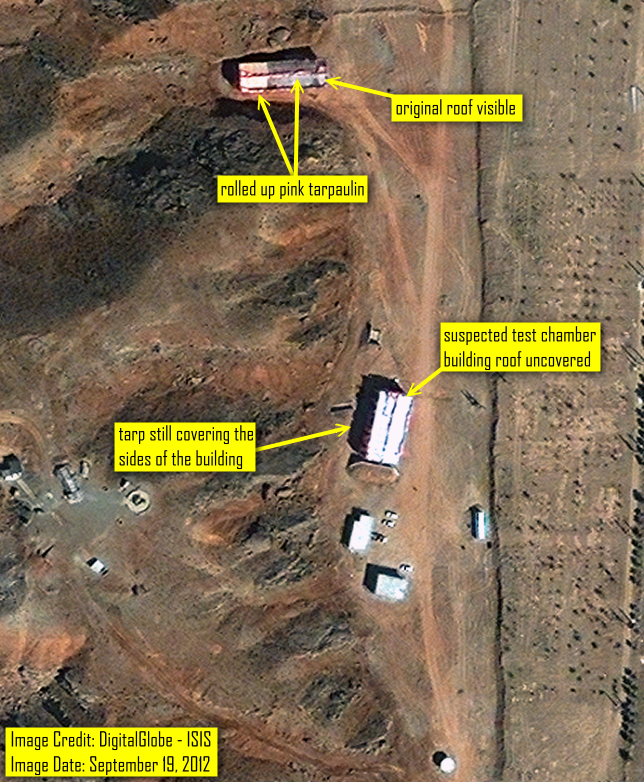 The latest commercial satellite imagery dated November 7, 2012 shows a considerable amount of activity has taken place at the alleged Parchin high explosives testing site in Iran linked to the development of nuclear weapons. A previous ISIS report with imagery from September 19, 2012 showed the ongoing removal of tarpaulins that had covered the two major buildings at the site since early August 2012 (see figure 1). In the latest November 7, 2012 image the tarpaulins are no longer present. Following the removal of the tarps the roofs of the two buildings previously covered have been repainted with blue paint or there has possibly been completely new roofing installed (the imagery does not allow the determination of whether the sides have also been repainted or replaced). In addition to the new roofing, the building suspected to contain the high explosives test chamber has been extended with the addition of a new section on the front of the building (figure 2). What appears to be a cement wall or terrace has been constructed alongside the perimeter spanning the two major buildings at the site. 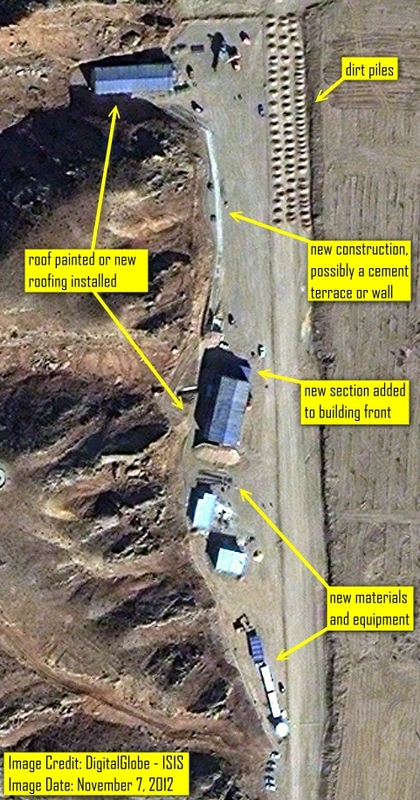 The considerable amount of new materials, equipment, and rows of earth piles suggest that further construction will be taking place thus increasing the level of alteration and further degrading the chance of obtaining reliable environmental samples if and when IAEA inspectors gain access to the site. Figure 1: September 19, 2012 imagery showing the pink tarpaulins that previously covered the buildings being rolled back. There are no signs of construction of the terrace/wall or of the dirt piles that appear in later imagery. Figure 2: The latest image from DigitalGlobe clearly showing the new blue roofing of the two major buildings, new equipment and materials and the rows of earth piles. Numerous cars present at the site suggest a considerable level of activity at the site.